As the mobile wallet begins to catch on, the next wave of mobile wallet startups are starting to come alive as well. Back in January we interviewed New Jersey startup PulseWallet at CES 2013 in Eureka Park. There we learned that PulseWallet is working on biometrics to serve as someone’s mobile wallet. Simply put, with this kind of technology you’ll be able to ditch your credit cards, debit cards, and loyalty cards. Instead, your finger will become your secure wallet. With a finger scan and a pin you’ll be able to pay for anything with any number of payment forms in a much safer, fraud resistant way. PulseWallet isn’t alone. Biometrics is a hot space as is mobile wallet. Four Carnegie Mellon University students have also recently launched a biometrics based mobile wallet called PayTango. According to the Pittsburgh Post Gazette, using PayTango a customer would swipe there finger and in less than 15 seconds they would be linked to their payment sources. “We wanted to eliminate the need to carry anything around to identify yourselves. Like you have these plastic credit cards and if you lose them or get the numbers stolen off them, essentially someone could wipe your bank account,” said co-founder Kelly Lau-Kee. Lau Kee says that credit cards are antiquated and haven’t really evolved in the last 40 years since their introduction. Yes security has gotten better and reconciliation is much more reliable with phone lines and the internet,but storing the information on the magnetic strip is still the same technology today as it was back in the 70’s. PayTango was brewed in Pennsylvania. All four founders; Brian Groudan, Umang Patel, Christian Reyes and Lau-Kee, are all either seniors or recent graduates of Carnegie Mellon. They conceived the idea in the fall of 2012 for a TechLab startup course at CMU and then continued working on it during the University of Pennsylvania’s PennApps Hackathon. The technology is currently up and running at three eateries on the Carnegie Mellon campus. For the live beta at CMU, over 700 students have registered their fingerprint which was linked to their student ID which has their meal plan attached. 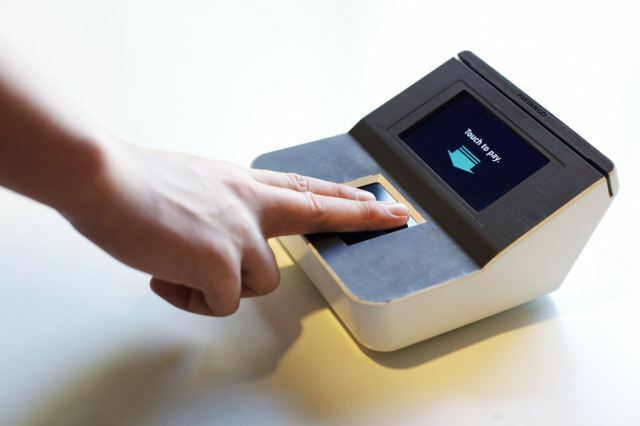 To eat at those eateries, students in the beta just swipe their finger at checkout. Now they’ve relocated to Mountain View California after being accepted into the prestigious Y Combinator accelerator program. They’ve already expanded PayTango into gyms, restaurants and convenience stores in Silicon Valley.